Art: Students make pencil sketches of natural landscapes or animals, design markers and signs, and create promotional material. Other possibilities include using leaves, flowers or bark as textural features or for decorations with other natural findings. English: The outdoor classroom can provide opportunity for students to keep a journal on the developmental progress of the outdoor classroom. Students can sit in the natural area and write poems or essays about their surroundings. Writing news articles on the outdoor classroom’s success would be an excellent opportunity to practice journalism. A monthly newsletter may be developed. History: The outdoor classroom can be used to study of how early settlers and Native Americans used natural resources to make artifacts, grow food, make clothes and live off the land. Students may look at the history of the outdoor classroom site to see how it has changed over time. The outdoor facility could be used to study other cultures. Family and Consumer Sciences: Students could learn how to grow a vegetable or flower garden and the economic benefits of doing so. Outdoor cookery or food preservation could be practiced. Students can study edible natural plants. The students may help plant some of the shrubs and trees. Natural items could be used as decorative features of the home or classroom. Health/Safety: Students could locate poisonous plants in the outdoor classroom, identify them and study potential human health effects. Students could practice first aid by simulating outdoor scenarios. Students may want to search the outdoor classroom for potentially unsafe areas and describe what should be done to correct them. Natural remedies might also be planted and discussed. Life Skills: The outdoor classroom is filled with opportunities that can help young people gain skills and knowledge in citizenship, ethical decision-making, leadership, teamwork, responsibility, achieving goals, building relationships, communication and self-esteem. Knowledge and skills in these areas may be attained through hands-on projects, learning by doing, making positive contributions to society and by participating or leading organized outdoor activities in the outdoor classroom. Mathematics: The outdoor classroom is a prime area to study mathematics, especially in the developmental stages. Math students may assist in calculating featured plots, determining the size of the developed area or measuring slope and elevation. Students could also measure tree heights and diameters, weigh large outdoor objects and tabulate volumes. They can also learn to use a map and a compass. Measuring, cutting and constructing habitat boxes and feeders are direct applications of math concepts. Music: Music students could study how different cultures use nature as a part of their music. 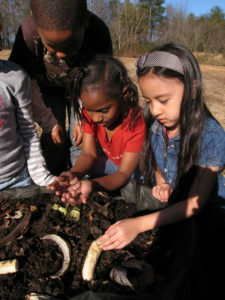 Students may make instruments from items they find in the outdoor classroom. Students could study other musicians who use nature as their inspiration, and possibly use the outdoor classroom in preparing their own music. Physical Education: Outdoor classrooms provide prime opportunities for PE students. Activities such as hiking, running cross-country, exercising and playing outdoor games can be included in the class curriculum. Students may create games from objects they find in the outdoor facility and many of the activities can be combined with other subjects. Measure the walking trails and post distances so that “walkers” can set and achieve goals for regular exercise. Science: The outdoor classroom is a “natural” science lab. Science students can conduct experiments that should only be attempted outside. Students could study aquatics, soils, animals, air, weather and plants and how living organisms interact with each other, as well as biology, chemistry, ecology or geology. Natural communities and ecosystems found in the outdoor facility can be observed. Technology: An outdoor classroom is an excellent place for students to learn more about the use of different technologies. Students can take digital cameras into the outdoor classroom and capture images of insects, flowers, snakes, animals and other natural scenes. The images can be used to design Web pages or presentations about the outdoor classroom. Students may learn new concepts of Global Positioning Systems and Geographical Information Systems. Vocational Agriculture: Vocational agricultural students will have plenty of objectives in their curriculum that will include and involve the outdoor classroom. Students can study pond management, forestry management or participate in land judging. Other areas to consider include designing trails; participating in building shelters, bird feeders and picnic tables; or growing the flowers and plants needed for the facility. Life SciencesWhat are the differences between living and nonliving things? How are humans like plants? How are they different? Distinguish and describe differences and similarities. How does a plant grow? Observe the life cycles of plants using fast-growing plants in your classroom. What do plants need to grow? Do all plants need the same things? Study the vari- ous conditions that different plants need to grow. Compare the things people need to the things plants need. Create experiments investigating what happens when plants are exposed to different amounts of light, water, air, space, and nutrients. Investigate the functions of different plant structures (cotyledons, roots, stems, leaves, flowers, fruits, and seeds). How do plants reproduce? How do seeds work? Dissect flowers and seeds. What factors influence germination of seeds? Create experiments to investigate how light, heat, and moisture affect germination. Explain to students that some characteristics are inherited and some are caused by the environment. Locate examples of both in your garden. How do plants use energy from the sun to make food? Discuss photosynthesis. Do plants need light to photosynthesize? Discuss how plants adapt for their survival. Research the adaptations of seeds for dispersal and adaptations of flowers for attracting pollinators. Observe pollinators in the garden. Investigate the impact of environmental changes on plants. Study wildlife and insects and their habitats. Investigate food chains and food webs. Demonstrate how plants are the primary source of energy for all food chains. Create a garden weather station. Record daily measurements and compare conditions with plant growth. How are some soils different from others? Compare and contrast the properties of different types of soils (density, air spaces, presence of living organisms, composition, texture, smell, appearance). Simulate soil erosion in your classroom garden. Observe the difference in soil loss when water is splashed on a tilted, planted pot, and on a tilted, unplanted (but soil-filled) pot. What is pH? How does it affect plants? Use litmus paper or a test kit to test the pH of different soils. Investigate how plants respond to soils with different pH levels. Simulate the water cycle in the indoor garden by covering it with a “dome” of clear plastic. Study and observe the transpiration, evaporation, and condensation of water. What are the properties of different types of light? Cover pots with cellophane of different colors to screen out all but one wavelength of light from plants. Observe plant growth. How does energy change to matter during photosynthesis? The garden provides a plethora of opportunities to practice basic mathematical activities such as calculations, comparisons, measurements, and varied represen- tations of data (charts, graphs, etc.). Math becomes practical and relevant when students implement concepts they have learned in the classroom in a real- life garden setting. Designing and planting a garden takes mathematical problem solving and practice. Gardening activities help to motivate students often confused by abstract textbook questions and examples. Measure the growth rates of plants and display results on different types of graphs. Make predictions regarding future growth. Use standard and nonstandard units of measurement. Host a bean race. Plant a number of beans at the base of a trellis and track their growth on a chart. Determine the rate of growth and award the fastest plant a blue ribbon. Using information from seed catalogs, predict dates of germination and maturity. Plan backward from a desired harvest date to determine when each crop should be planted. Measure your garden parameters and calculate the area. Use graph paper to make a map to scale of your garden. Calculate amounts of fertilizer to use per quart and per liter of water. Chart temperatures of the air and soil in your garden in Fahrenheit and real-life experiences in reading and math, and an opportunity for teachers to extend learning beyond the classroom. Determine the weight and volume of soil mix when wet and dry. Determine the volume of soil in a rectangular window box. Investigate vegetable prices in a supermarket. Track the amount of produce harvested in your garden and use the market prices to determine the value of your harvest. Count the number of seeds planted and the number of seeds that sprout and calculate the germination rate. Measure the height of a group of plants and determine the mean, median, and mode. Calculate serving sizes of different fruits and vegetables using common cooking supplies. Make a recipe that uses fruits and vegetables from the garden and requires various measuring techniques. Research and report on cultural or ethnic differences in food consumption and gardening practices. Research agricultural history and create a timeline of important events. Visit some local farms and interview farmers about choice of crops, growing practices, marketing, and farm history. Study the contribution of Native American foods and other cultures’ foods to our history and diet. Grow samples in the school garden. Research the histories of classroom garden plants. Discover where they originated, the impact they’ve had on our diets, and how today’s varieties differ from the original plants. Locate their origin on a map and then trace their movement around the world. Use the Thanksgiving holiday to explore meals throughout history and the different crops grown and harvested at that time of the year. Complete a site analysis of the school garden and create a garden map noting important features, including a north arrow. Trace the path of a fruit or vegetable from the field to the table. Use the classroom garden to complement a study of the influ- ence of climate on food production. As a class, develop garden rules and then vote on them. Keep daily garden journals documenting observa- tions, weather conditions, and classroom activities. 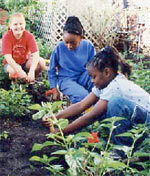 Research the growing habits of the school garden plants using the Internet and reference material. Create a planting schedule based on the information. Write letters to local merchants explaining the school gardening project and asking for donations. Write thank you notes to volunteers and garden sponsors. Write, illustrate, and publish a collection of garden stories and poems. Brainstorm different adjectives to describe each plant in your garden. Study new vocabulary that relates to plants and gardens. Publish a class newsletter with student articles about the garden and distribute it to other classrooms and parents. Write step-by-step instructions for common garden activities. Follow written instructions to perform a garden task like planting seeds. Read books and stories about plants and gardens. Write a research paper on a favorite plant, including source citation. Learn about the origins of scientific plant names. Read a garden magazine article highlighting a plant and distinguish between the facts and opinions presented by the writer. Research the nutritional value of your favorite garden vegetable and then write a script for a 60-second advertisement designed to get more people to grow and eat it. Nature is the inspiration for many works of art, dance, music, and drama. Your school garden is a small piece of nature that can inspire budding artists. Create paintings and drawings of garden plants. Paint a class garden mural to hang in the hallway for parents’ night. Create a color wheel collage using pictures from old seed catalogs. Make musical instruments from gourds and learn how to play them. • Make prints using paint and stamps made from various plant parts. Create and perform a garden-inspired dance expressing the growth of a seed or the opening of a flower bud. Pantomime various gardening tasks (transplanting, fertilizing, sowing seeds, pollinating). Learn a collection of songs that relate to food, gardens, and the environment. Listen to the music of composers inspired by nature. Build clay or tissue paper models of flowers. Use leaves to make crayon rubbings or fossils in clay. Using a movie camera with single-frame capability, make a time-lapse film of a plant growing. Create a skit about food safety. Paint a classroom mural using samples of different soils as the medium. Compare the importance of nutrients in the health of humans and of plants. Study the nutritional value of the various crops in your garden. Identify the parts of the plant represented by common fruits and vegetables. Discuss the difference in nutritional value of various plant parts. Study the adaptations of plant parts that make them good food sources. Sprout various seeds for eating. Conduct a blindfolded taste test using classroom-grown vegetables and supermarket vegetables. Experiment with food preservation techniques like drying, freezing, and canning. Grow a salad garden and give students a chance to sample the harvest with a salad party. Invite a grocery store employee to talk to the class about where their products come from. Create a brochure with information on daily food intake recommendations. Plan a day’s menu that includes all components of a balanced diet. Keep food journals that highlight how many fruits and vegetables are eaten and describe any new produce tried. Invite chefs from the community to present cooking demonstrations for students and parents. Coordinate a cooking lesson in your school’s kitchen using the produce your class has grown. Invite a registered dietitian to visit classrooms and discuss healthy food best part was when we got to collect and count the money. choices and healthy preparation methods in connection with MyPyramid.gov. Present a skit or puppet show about food safety. Use MyPyramid.gov to help you choose a healthy diet. Come up with tasty recipes that use lots of fruits and vegetables and little fat or sugar. Create a classroom or school recipe book featuring produce grown in school gardens. Compare the nutritional content of different colors of a specific variety of vegetables, e.g., salad greens. Graph the Vitamin A content in the lighter-colored greens and in darker greens. Contrast this with other vegetables. Research and compare fruits and vegetables with various origins. Identify cultural dishes and their preparation methods. Host an “international day” and provide healthful samplings of fruits and vegetables from those cultures. Incorporate literature using the book Stone Soup and involve students in mak-ng their own stone soup. Have students discuss the benefits of the ingredients and how they fit into MyPyramid. Research cultural holidays and the symbolism of particular fruits and vegetables that are included during those holidays. For example, identify the symbolism of tangerines in the Chinese New Year celebration. Create a public service announcement or school announcement promoting fruits and vegetables. The promotion could highlight something growing in the garden, a fruit or vegetable offered in the cafeteria, or both. This will encourage students to develop skills for marketing food choices. Grow and use fresh herbs to flavor your dishes with natural ingredients and decrease the use of salt in recipes. Visit a local farmers’ market or start a school farmers’ market. These ideas are a sampling of classroom gardening activities available to you. Search books, magazines, and Web sites for additional ideas. As you grow with your garden, you will create many activities of your own. Be sure to pass them along to other teachers and parents. 7.Students who are behaviorally disturbed or learning impaired make greater strides in a garden.